Plas Plastic Packaging wanted to improve the scalability of its IT to support expansion, along with enhancing reliability to help personnel increase productivity. 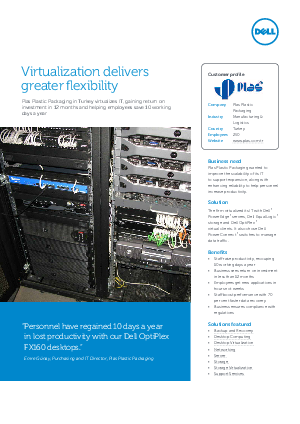 The firm virtualized its IT with Dell ™PowerEdge ™servers, Dell EqualLogic ™storage and Dell OptiPlex ™virtual clients. It also chose Dell PowerConnect switches to manage data traffic. To learn more how Plas Plastic Packaging in Turkey virtualized IT download this whitepaper today.